It’s hard to believe that three decades have passed since Breakthrough first started publishing a series of taxidermy instructional manuals. The first book in this series was “The Breakthrough Encyclopedia of Fish Painting” and the very first edition came in a large, tan three-ring binder, with all of the paint schedules printed on individual card stock. You could open the rings to remove, rearrange or add individual pages as your needs required. In 1984, we enlisted the help of many of the top fish taxidermists of the day to provide their step-by-step directions for how they painted popular species with an airbrush. Thus, the “paint schedule” was born, and this instructional format has been a staple in all taxidermy publications ever since. 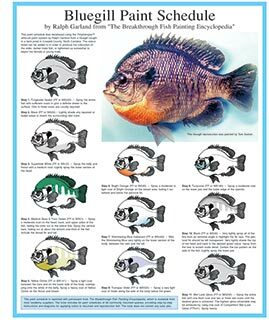 The bluegill paint schedule by Ralph Garland which is reprinted below, was also published in “North American Taxidermy News” a little over ten years ago. 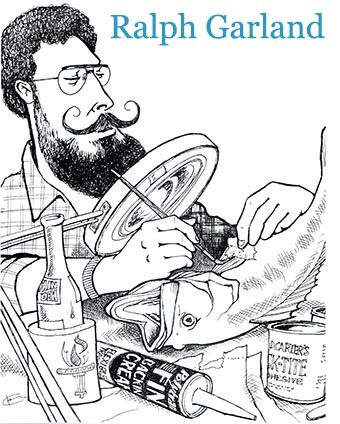 Many of the original contributors to the “The Breakthrough Encyclopedia of Fish Painting” are still with us. The author list still reads like a Who’s Who of famous fish taxidermists even 30 years later. Don Frank, Jeff Compton, Dave Baroncelli, Alan Gaston, Tom Sexton, Matt Thompson, Tom Lenort, Ralph Garland and Dave Ringstrom all leant their expertise to the success of this manual. Sadly, contributors Jim Hall and Tom Witbeck are no longer with us. 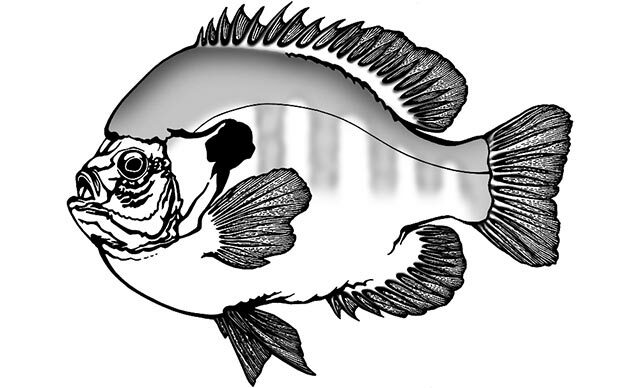 In the late 1980s, the manual was revised with new diagrams by Tom Sexton and Terri Chidester and republished in a comb-binder format and subtly renamed the new edition as “The Breakthrough Fish Painting Encyclopedia”. This edition of the book is still available today and is published by McKenzie. It can be purchased from the McKenzie website here. The great Ralph Garland of North Carolina spent most of his taxidermy career instructing others in the art. As a frequent contributor to all of the trade publications, and as the head of the taxidermy curriculum at the legendary Piedmont Technical College in Roxboro, North Carolina, Ralph is probably responsible for the training of more taxidermists than anyone alive today. Ralph’s tenure at Piedmont Tech, and the twenty-plus years of Taxidermy Mini-Courses that he coordinated each spring were frequently the largest gathering of taxidermists anywhere in the world each year. In the seventies and eighties, there were often over 1,000 taxidermists attending the Mini-Course. 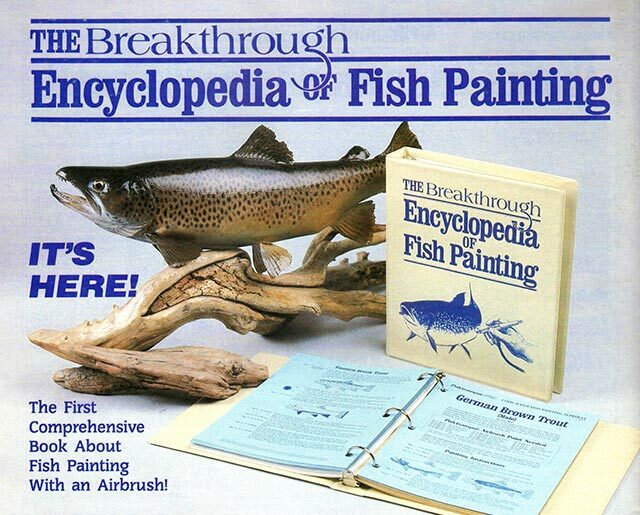 In 1984, Ralph generously contributed several commercial paint schedules for commonly-mounted fish species to help get “The Breakthrough Encyclopedia of Fish Painting” off the ground. 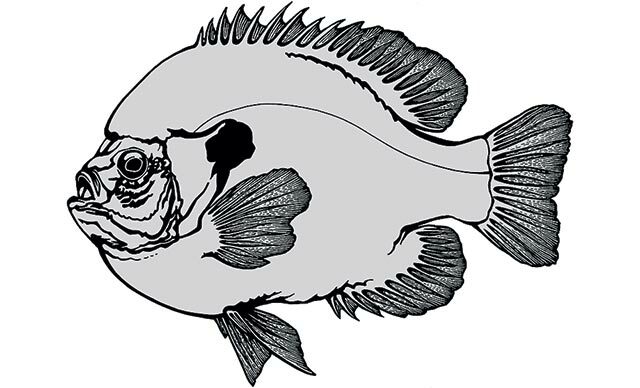 The simple but effective bluegill schedule reprinted below has stood the test of time, and is still an effective starting point for fish painting. 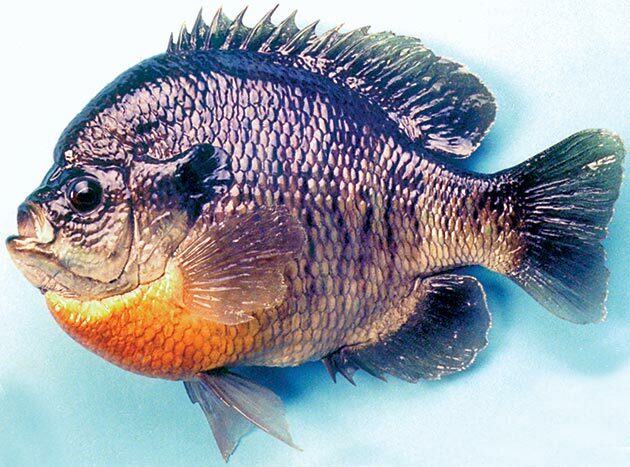 This bluegill reproduction was painted by Tom Sexton. This paint schedule was developed using the Poly­transpar™ airbrush paint system by Ralph Garland from a bluegill caught in a farm pond in Caswell County, North Carolina. 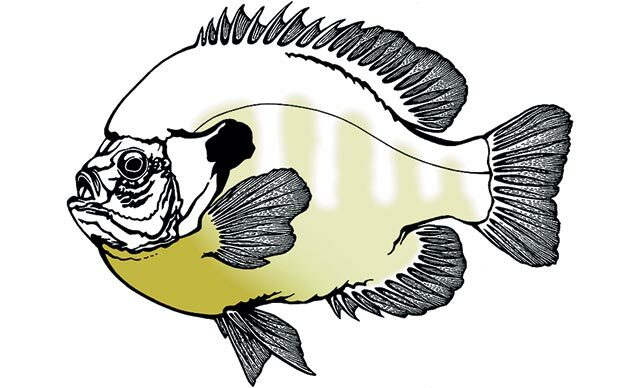 The colors listed can be added to in order to produce the ­coloration of the older, darker male fish, or lightened up somewhat to depict the female or young male. This paint schedule can be used equally well with either Polytranspar water-based (WA series) paints, or lacquer-based (FP series) paints. Use the same series for the entire procedure. Step 1. 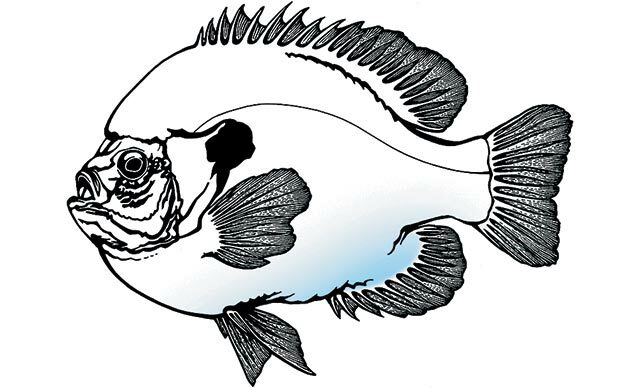 Fungicidal Sealer (FP or WA220) — Spray the entire fish with sufficient coats to give a definite sheen to the ­surface. One to three coats are usually required. Step 2. Black (FP or WA30) — Lightly shade any repaired or faded areas to match the surrounding skin color. Step 3. Superhide White (FP or WA10) — Spray the belly and throat with a medium coat. Lightly spray the lower section of the head. Step 4. 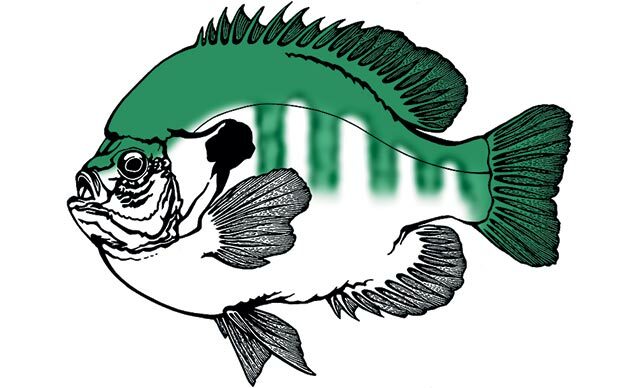 Medium Bass & Trout Green (FP or WA51) — Spray a moderate coat on the head, back, and upper sides of the fish, fading the color out at the lateral line. Spray the vertical bars, fading out at about the bottom one-third of the fish. 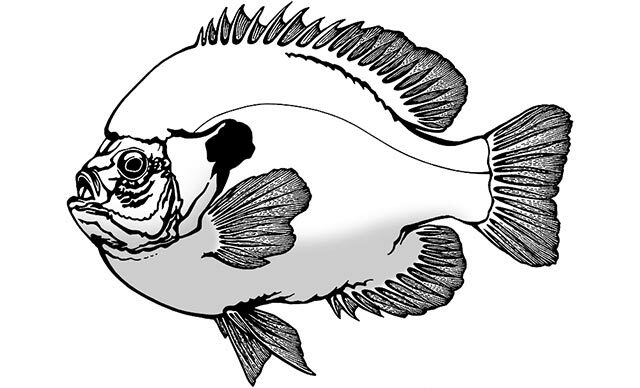 Include the dorsal fin and tail. Step 5. Yellow Ochre (FP or WA141) — Spray a light coat between the bars and on the lower side of the body, overlapping onto the white of the belly. Spray a heavy coat of Yellow Ochre on the throat and breast. Step 6. Bright Orange (FP or WA90) — Spray a moderate to light coat of Bright Orange on the breast area, fading it out behind and below the pectoral fin. Step 7. Shimmering Blue Iridescent (FP or WA440) — Mist the Shimmering Blue very lightly on the lower section of the body, between the vent and the tail. Step 8. Transpar Violet (FP or WA320) — Spray a very light coat of Violet along the side of the body below the green. Step 9. Turquoise (FP or WA180) — Spray a moderate coat on the lower jaw and the lower edge of the opercle. Step 10. Black (FP or WA30) — Very lightly spray all of the fins from an extreme angle to highlight the fin rays. 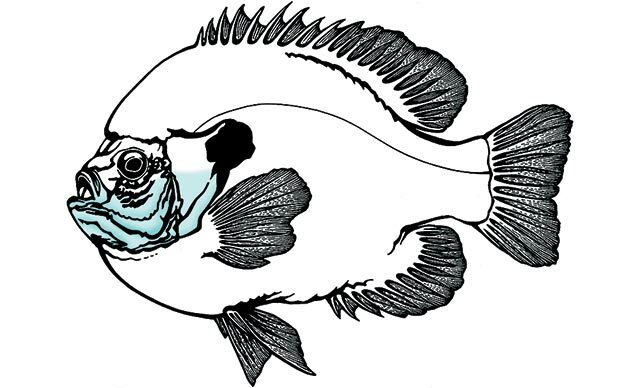 The pectoral fin should be left transparent. Very lightly shade the top of the head and back to the desired green value. Spray from the rear to accent scale detail. Darken the bar pattern on the side of the fish. Lightly spray the lower jaw. Step 11. Wet Look Gloss (FP or WA240) — Spray the entire fish with one flash coat and two or three wet coats until the desired gloss is achieved. The highest gloss obtainable may be achieved by using one coat of Competition Wet Look Gloss (FP241). Spray heavy.